Didn't really eat much the day before. Maybe it was the walk but I knew I had to put in some extra punch instead of just cafe con leche and tostado for my morning fuel today. Guess what I found at the Carrefour Express yesterday? Pollo Tika Masala TV dinner! It was so good having it in the morning at the albergue and dipping some leftover bread to clean up every bit of the sauce. That and leftover ham sandwich and eggs (I always buy half a dozen and boiled them whenever there is an albergue with a kitchen). I was burping the masala for the first 10 km of the day. Only need a coffee at the bar before I start. 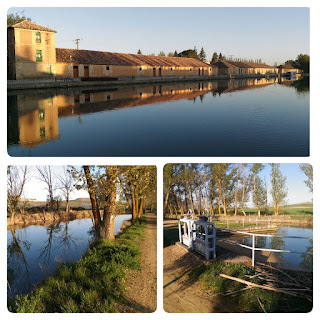 Started late after 8 am and it was a dreamy walk along the canals leaving Medina de Rioseca. This is part of a canal networks that joins many cities from Valladolid and up to Palencia. I remembered walking through some canal floodgates on the Camino Frances which is part of this canal network. Beautiful and dreamy walk! 10 km later left the canal turned right but the arrows straight 4 km towards Tamariz de Campos. A small town with a broken old church and one bar that wasn't opened. A short break outside the closed bar only for a nibble thanks to the masala and sandwich in the morning before heading on. Maura was ahead and took route with the arrows. My map shows a shorter route (1.5 km less?) but no arrows. She was ahead and could hear me shouting. 8 km on the open fields and in Cuenca de Campos I ask a guy walking towards me if there is a bar. He thought I was looking the albergue but I said no, bar first. A pilgrim always know his/her priorities. He took me to the only one of the two bars here 20 meters off the route (there is other bar which is on the route but he said it was closed) and proceed to talk to his friends. Ah well, I figured where he intended to go were not important. The bar with a terrace were crowded with people. I guess the celebration for Semana Santa had started much earlier.. In the past few days the bars in villages with only 50-200 population had been unusally crowded. Sandro was already there in the bar! He told me they serve lunch and seeing that it is around 2 pm I decided to join him for lunch. Mixed hot vegetables (with cauliflower), roast spring lamb (common during the holy week), chocolate mousse and finished with a Cafe Cortado. Excellent, well worth the 13 euros no including the drinks. This was the most food I had on this Camino. 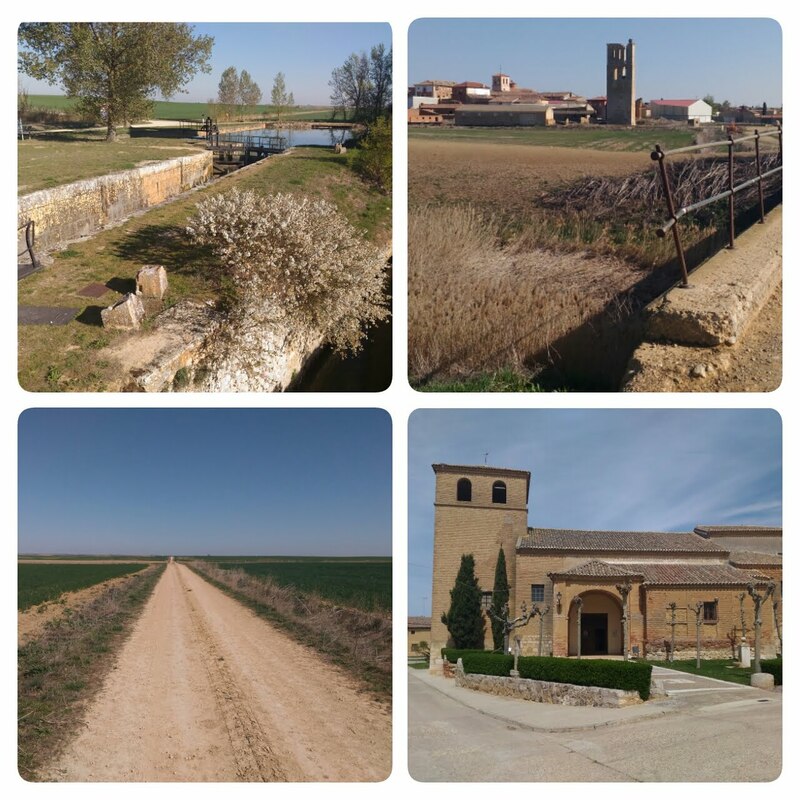 I was going to stay here having already walked 22 km but decided I will join Sandro another 5 km to Villalón de Campos (also a bigger town with more facilities) to walk off the big lunch. Also I suspect Maura the conejo (rabbit) would probably missed the bar (albergue door still closed) and probably on her way to Villalón de Campos. Lots of villages and towns around here with campo(s), field(s). Can easily guess this area are mainly agricultural. The route there is along an old train track, only a few tracks remained. At Villalón de Campos (total 27 km) we saw Maura sitting on the bench outside the town hall. Super we thought until Maura said the albergue was full. What! How can it be? Apparently for reasons the people here don't want to tell us, there were families staying there today. But the albergue are for pilgrims! 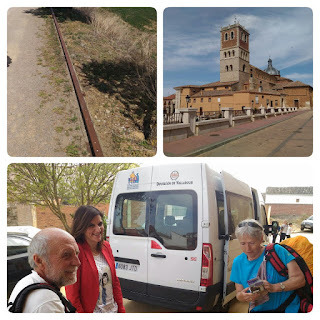 Instead we were told to wait as they try to get a van to bring us to the albergue in Santervás de Campos (15 km further down the route). I asked if there would be transport back to Villalón de Campos tomorrow morning but apparently no, unless we hire a taxi. I did a quick check to the hostal Peña right across the street and as expected it was complet (full). Too exhausted to think of anything else we got into the van and saw more of the same open fields like the second half of today in the 15 km to Santervás de Campos. But I like walking in the open fields and now I have been denied this stretch as the others (me too) weren't keen on sharing the 20 euros taxi back tomorrow. That means tomorrow will be the last day as Sahagun is 19 km from here. Even without the 15 km assist it could also be the last day at 34 km. The lady besides the driver was friendly and explains the plight of these small villages here who don't need much labor as much of what's growing in the field only needs one or two person and much of the work is automated including watering. Many young people are leaving to find jobs in bigger cities like Valladolid or Léon, much of the same problem in many parts of the world. They drove us right outside the albergue in Santervás de Campos. 6 euros for the albergue. Miguel the big guy showed up in the albergue an hour later. Incredible guy. He walked all the way eating only what he carries and only drinks milk at the bar. The hospitalero also owns the only bar and food place in this town which is also in the same compound. Albergue is 6 euros, no kitchen (just a microwave oven. No shops. As Sandro and I already had a big lunch, dinner is only a salad and yogurt. Sandro and I asked for 2 bocadillos (sandwiches) each as there will be no food facilities all the way from here to Sahagun. Maura besides the salad ordered the cured meat and asked for bread to make herself a.small sandwich which apparently is enough for her considering she only eats what she bought yesterday. Ivan is probably far behind in Cuenca de Campos. Will know in time. Like in Peñaflor, no cell network coverage here (at least not for Orange/Vodaphone). No Wi-Fi either. Guess this post will have to wait until tomorrow to be updated.